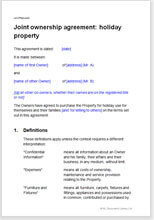 This agreement records in what proportions a holiday home is jointly owned, how the owners can use it, and what happens when one owner wishes to sell. This fractional ownership agreement covers the situation where two or more people share ownership and use of a house, flat or other property for holiday occupation. The house or flat may be enjoyed by both owners (although not simultaneously for long periods of time) or rented to others for short stays. Broadly, the contents of this document cover three areas: ownership, management and sale. Under UK law, the registration of ownership does not record the shares in which a property is held. It assumes ownership proportions are the same as the proportions that the owners contributed to the purchase price. So if the arrangement is that one owner puts down a larger share of the deposit, but the other pays the majority of the mortgage and is entitled to a share of the sale price as calculated by a formula of their joint devising, all of that needs to be recorded in an agreement such as this one. This agreement can also record a beneficial interest – that is the share owned by someone who is not registered on the deeds. For example, that could be a family member who has loaned one of the owners money to contribute to the purchase price. Ownership is discussed further in this article. Expenses relating to maintenance and excessive use by one owner to the perceived detriment of the other are common reasons for the souring of the business relationship. By setting out who pays for expenses and upkeep, and how use of the holiday property is shared, arguments can be reduced. This contract also lets you decide what happens if either side wants to sell his or her share, or the whole property. An investment in a holiday home can be significant, and it will be important to both sides that neither holds up a sale or reduces the price if the other wants out of the arrangement. If you are living with the other owner in the house or flat for significant periods of time, we have another ownership agreement for residential property.